Lack of adequate food intake is a substantial problem in any veterinary intensive care unit (ICU). This is because the diseases our patients have are often associated with significant anorexia or even an inability to eat. Additionally, we schedule diagnostics or surgical procedures that lead us to withhold food from our patients. We are all guilty of writing NPO on a treatment sheet because diagnostics MAY be done that MAY necessitate a fasted patient and even sometimes forgetting to communicate when those NPO orders can be withdrawn. This may be a minor problem in the minimally sick patient or elective surgery patient but can be detrimental in the critically ill dog or cat. Intuitively we know that animals that are eating usually do better in hospital. A retrospective study showed that 93% of animals that ate voluntarily left the hospital vs. 38% of those that did not intake any food. What these studies don’t show is whether supplementing nutrition with enteral support in addition to offering food will improve outcome or whether healthier animals are just more likely to eat and therefore more likely to go home. Whether or not supplementing nutrition improves outcome seems like an interesting question to ask in pets, however in human medicine the evidence is already clear that enteral nutrition improves outcomes. When we talk about supported nutrition I am referring to nasogastric (NG) tubes, gastric (G) tubes, esophageal (E) tubes, etc. I generally do not support the use of force feeding as they can develop severe food aversion. In animal models, fasting leads to intestinal mucosal atrophy and increased rate of enterocyte apoptosis. This decrease in mucosal mass has been found to be up to 40% in rat models. These changes all lead to a breakdown of the intestinal barrier resulting in increased intestinal permeability. Though starvation alone may be insufficient to increase gut permeability, injury such as malperfusion followed by starvation increases mucosal permeability proportional to the severity of disease. 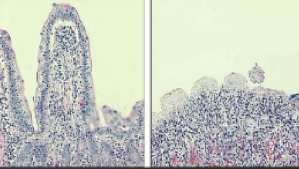 Histopathology images of the intestine show a normal villus on the left and an atrophied villus on the right secondary to fasting. Enteral nutrition (EN) supports the functional integrity of the gut by maintaining tight junctions between the intraepithelial cells, stimulating blood flow, and inciting the release of trophic endogenous agents (agents that increase cell growth). EN also maintains the structural integrity of the gastrointestinal tract by maintaining villous height and supporting the immune cells of the intestinal tract. In addition, EN may decrease inflammatory cytokine production, modulate the inflammatory acute phase response, and decrease catabolism (protein breakdown) to preserve protein. Clinically, the hot topic of discussion is when EN should be instituted. According to the American Society of Parenteral and Enteral Nutrition (ASPEN), EN should be started within the first 24 to 48 hours (as they generally classify as early) following admission or the insult of the hypermetabolic state. Delay of >72 hours causes more gut permeability, activation of cytokines, and more systemic endotoxemia (systemic infection). With Early EN (EEN), there is a lower incidence of infection, reduced hospital stay and decreased mortality in humans. There is also increased intestinal wound healing. The reason EN is not always initiated early is that there is concern for more risk in very sick patients. Concerns such as gastrointestinal complications, aspiration pneumonia, and dehiscence have been shown in human medicine to not be more frequently observed in EEN and actually may decrease in incidence with EEN. Though I am obviously a large advocate for EEN, there are reasons to wait. It is generally recommended to not initiate EN when a patient is on escalating doses of vasopressors or if they are undergoing massive transfusion. That being said, patients on stable doses of vasopressors can have EN initiated and it is often tolerated well. For those patients that do not tolerate large volumes of EN, a strategy called trophic feeding can be used. Trophic or trickle feeding is a low percentage of the resting energy requirement (RER) given over the day. This kind of feeding has shown to still promote motor patterns in the gastrointestinal tract (GIT) and provide trophic agents to the gut in a manner similar to full RER. Gastric residual volume aspiration is simply measuring the amount of fluid remaining in the stomach which can be used as a diagnostic to assess tolerance as well as a treatment for patients who are showing signs of GICs. At the height of critical illness, patients are prone to gastrointestinal dysmotility, sepsis, hypotension, increased risk for subclinical ischemia/reperfusion injury involving the intestinal microcirculation. GIT motility disorders are common in critically ill patients and dysmotility can affect the entire GIT but predominantly manifests as hGRV and vomiting. ASPEN directives still overwhelmingly say don’t stop EN!! Inappropriate cessation of EN should be avoided. Cessation of infusions of nutrition occurs in >85% of patients for an overall decrease in infusion time (and amount of calories) of 20%. It seems to be avoidable in > 65% of occasions. Patients randomized to continue EN during frequent surgical procedures (i.e. burn debridement) had significantly fewer infections. Common gastrointestinal complications of EN include vomiting (~30% of dogs and cats), regurgitation (~15%), diarrhea (40%) and high gastric residual volume. The important thing to remember with these numbers is that these tubes are not being put in normal healthy animals. It is likely the disease the animal has is a huge contributor to the gastrointestinal signs and all signs cannot all be blamed on the tube itself. High gastric residual volume (hGRV), the fluid remaining in the stomach after feeding, is common due to ileus and delayed gastric emptying. There was concern that hGRV was a risk factor for aspiration pneumonia but this has not been supported by research. EEN after surgery in dogs and cats has been found to decrease complications, prevent gut permeability, and increase bursting strength of the intestinal surgical site. There is also a trend to decreased mortality. A veterinary study looked at dogs with septic peritonitis and found that dogs that got early nutrition (those that ate, had supported enteral nutrition, or parenteral nutrition) had a shorter hospitalization by 1.6 days. Below are tips on how to calculate the dose for enteral nutrition needs in dogs and cats. Resting energy requirement (RER) is the caloric needs to maintain basic body function. Multiplications of the RER has been used to calculate caloric requirements for critical illness but newer evidence has shown that these higher requirements are not needed AND giving higher than RER can actually be detrimental. The reality is …is whatever is best for the clinic is fine for the dog or cat. I hope these tips help you understand a little more about nutrition in the critically ill dog and cat.